the coveted status of "Special Agent" acting as conference participants for the SBI Bureau of Internet Affairs. Are you attending the Chicago SBI Conference in September? As a very unique and once-in-a-lifetime opportunity, you have been chosen as one of the select few to be officially deputized as a avid SBIer who has demonstrated unrelenting devotion and dedication to the fine art of building a SBI online internet business. Your passion and efforts have not gone unrecognized. By the cyber power I invested by me in myself, I am hereby pleased as punch to appoint you to "Special Agent" status of the Site Build It! Department of eCommerce, Bureau of Internet Affairs: SBI Division of Online Business. 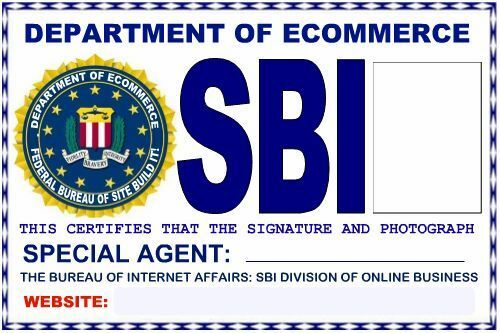 Please take this opportunity to save this badge of SBI honor to your computer and customize it as befits your new and highly exalted SBI "Special Agent" status for the Chicago conference. This badge will provide the proper identification for that poor, misguided and exceptionally confused (and occasionally irritating) reservation clerk who has been expecting an entourage of FBI agents rather than SBI conference attendees who have been chosen as Special Agents representing the SBI Bureau of Internet Affairs- Division of Online Business Solutions. Simply right click your mouse and select "save picture as" to a file folder on your computer. Open the SBI ID badge template in your graphics program. (I use Picnic which is available in the SBI Graphics Headquarters). Insert a text box with your signature after "Special Agent"
Resize your badge if you like, print it out on card stock, and take it to your local office supply store to have it laminated. May I suggest also purchasing a retractable ID Badge clip so you can easily flash it to the front desk clerk at the hotel. Finally, a pair of dark sun glasses, fedora, and trench coat with the collar turned up will complete your assemble.